The past two days of Adirondack weather illustrate perfectly the wisdom that change is the only constant. Just a few days ago, skiing was stunning in and around Lake Placid. The cross-county trails at Mount Van Hoevenberg were in the best shape of the season, Whiteface was "fantastic," and the Adirondack back country was simply superb. Then, yesterday morning the sun came out. It was a refreshing spring-like treat for a couple of hours until the snow began disappearing. Then the bad news: things change and the temperature went up to 46 degrees, the wind gusted to 50 mph, and it started to rain. Always the optimist, I held out hope it would turn to snow before the end of the day. Not this time. It rained and gusted all day yesterday until dark. Naturally, the temperature fell overnight and it was 3 degrees outside when I woke this morning. Needless to say, the remaining snow is rather solid. We received a skiff of snow overnight; two flakes deep and just enough to hide the slippery ice. The weather forecast is calling for sub-zero temps tonight. At least the World Champion Bobsledders currently competing at the Bobrun have ice on which to slide. So, the skiing will suffer for a bit while we wait for the next change and the good news. 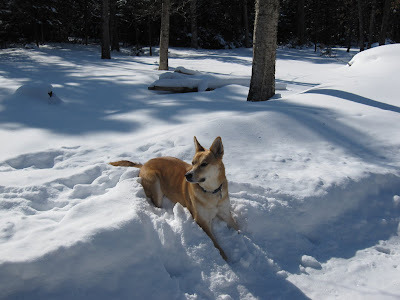 Today's featured photo is the Chloester, our pretty grand-daughter dog, alertly anticipating the change two days ago.